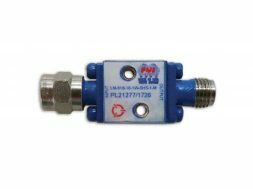 Model P20T-7G18G-80-T-515-SFF-SP is an absorptive, SP20T PIN diode switch that operates over the 7.0 to 18.0 GHz frequency range. This model incorporates a TTL compatible driver for easy system integration. Insertion loss is 7.5 dB max. ; isolation is 65 dB min. ; amplitude tracking is 0.5 dB peak-to-peak (all output ports); VSWR IN/OUT 2.0:1 max./1.8:1 typ. ; RF switching speed 1 µs max. ; input power 1W CW max./75W peak (1 µs PW) max. ; and power supply +5 VDC (+/-5%) @ 500mA max., -12 to -15 VDC (+/-2%) @ 200mA max. Unit contains solder pin and SMA Female connectors.